A fungal infection of the scalp by mold-like fungi is called tinea capitis. 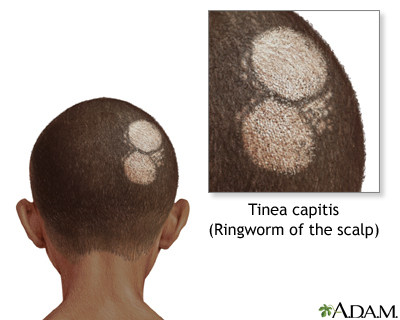 Tinea capitis (also called ringworm of the scalp) is a skin disorder that affects children almost exclusively. It can be persistent and very contagious. Symptoms may consist of itching, scaly, inflamed balding areas on the scalp. Oral antifungal medications are required to treat the infection.